Welcome to our apparel round-up. It’s a one-stop shop for flashsales, deals, promo codes and (god forbid) even rebates. Here you’ll find the Internet’s best offers on everything from cashmere to charm bracelets, curated and judged. Please let us know in the comments what you bought, so we can live vicariously through you. Commerce Content is independent of Editorial and Advertising, and if you buy something through our posts, we may get a small share of the sale. Click here to learn more. We want your feedback. Ruffled aprons, ceramic doorknobs, Peruvian ponchos—Anthropologie strictly traffics in wares that no one needs, but everyone wants. Shop their selection of doodads and trinkets now to receive a generous 30% discount when you use the code XTRA30. Despite its matronly reputation, Banana Republic consistently churns out sophisticated, playful designs—at a modest price, of course. Today, all sale items are reduced by 40% with the code BRSALE. UPDATE: The fine print states that only items that end in .99 or .97 are eligible for the deal. It’s hogwash, I know. Items with an asterisk will work. For a site that ostensibly began as a one-stop shop for rave attire, Nasty Gal sure has grown up. Below, peruse a stunning collection of denim jumpsuits, maxi dresses, and suede hats—all at a 40% discount applied at checkout with the code OHSHIT. 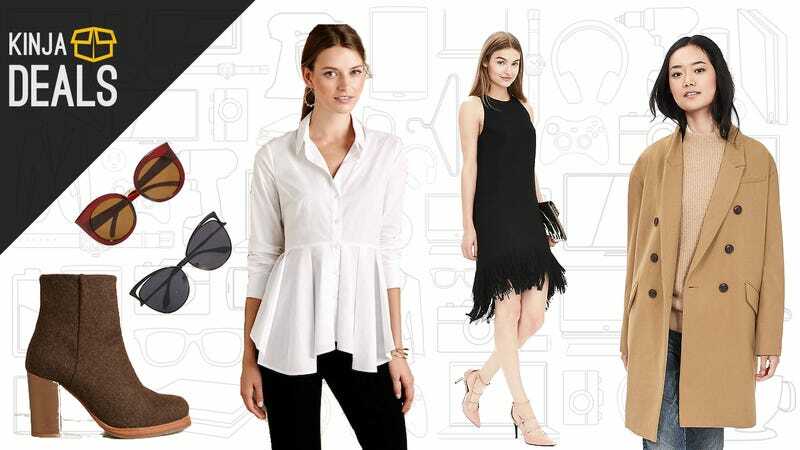 Lord & Taylor sells a whole host of luxury staples—from UGG and Jill Stuart to Hunter—that are all briefly reduced by a whooping 25% with the code FRIENDS. For those that still need some generic stocking stuffers, Amazon is taking up to 60% off scarves, gloves, and hats. Below, we’ve assembled the choice cuts.